This lovely 12th-century basilica stands over two previous sacred buildings: a church built in 392 and a 2nd-century Mithraic cave temple. 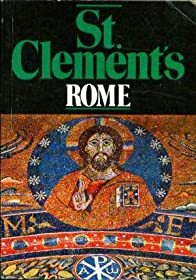 Boyle, Leonard E. A Short Guide to St. Clement's, Rome. Collegio San Clemente Via Labicana 95, 1988. Altar in the lower church, at the west end of the central nave. Credit: Holly Hayes. 11th- or 12th-century fresco on the left (south) wall of the lower church. It depicts St. Clement at Mass, as part of the story of Sisinnius told in the Golden Legend. Sisinnius was an unbeliever with a Christian wife, Theodora... Credit: Holly Hayes. The bottom half is all that remains of an 11th-or 12th-century fresco depicting the enthronement of St. Clement by Saints Linus, Peter, and Cletus. Below is a fresco of the story of Sisinus. Credit: Holly Hayes. 12th-century choir of the Upper Church, looking towards the high altar. Inside the altar are the relics of St. Clement of Rome and St. Ignatius of Antioch. Credit: David Joyal.